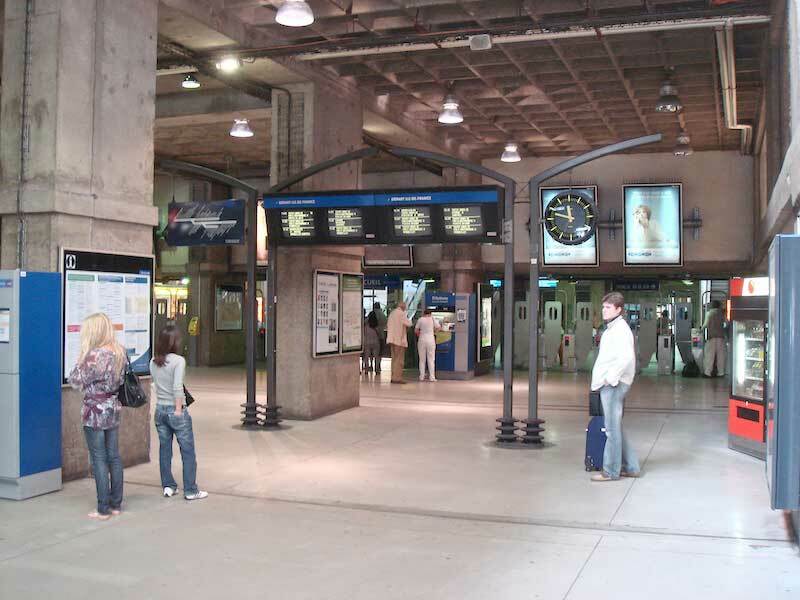 Photo of the front of Gare Montparnasse in the 6th Arrondissement of Paris, opposite Montparnasse Tower (Tour Montparnasse). 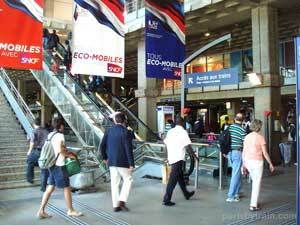 The following section will explain how to get to the Metro station at Gare Montparnasse if you’ve recently arrived via bus or on foot. 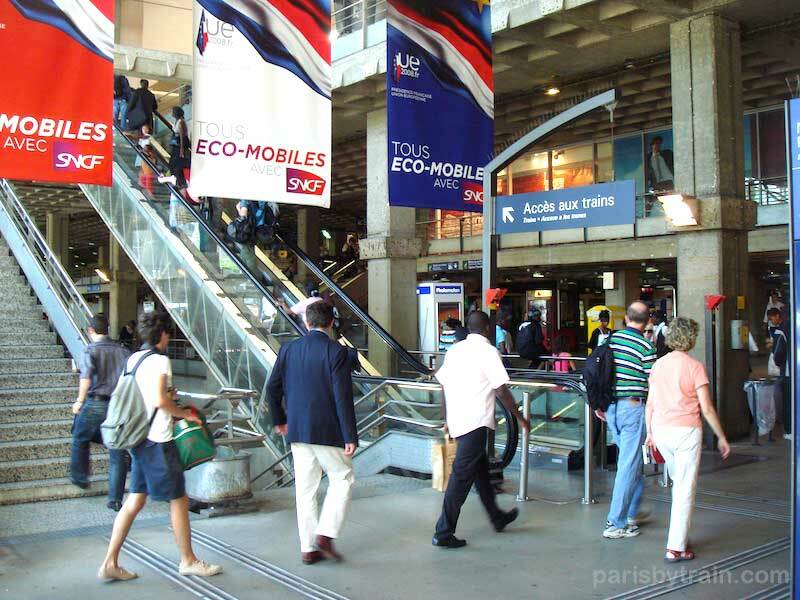 Upon entering Gare Montparnasse from street level (Niveau 0), you’ll have stairs and escalators leading up to the main train lines (TGV, Ter, Transilien, two floors up on Niveau 2) on Level 2 or you can continue forward towards to the Metro area. 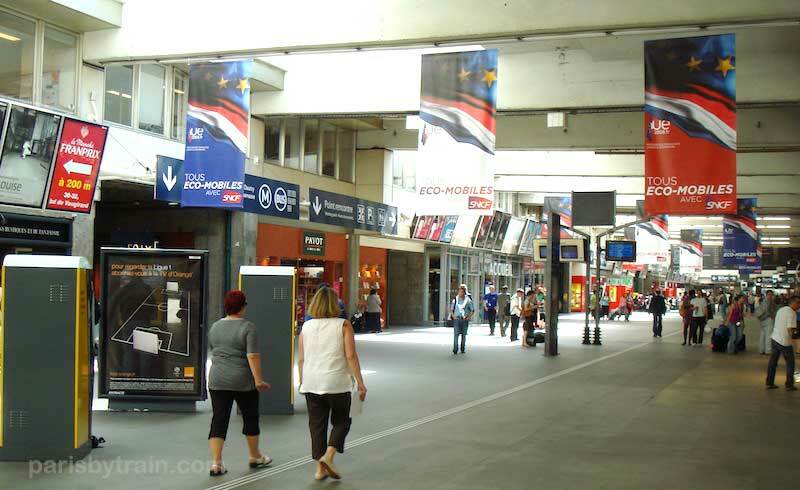 From the entrance of Gare Montparnasse, walking straight ahead and down, you’ll enter Sublevel 1 (Niveau -1) where you’ll find the entrance for Metro lines 4, 6, 12 and 13. 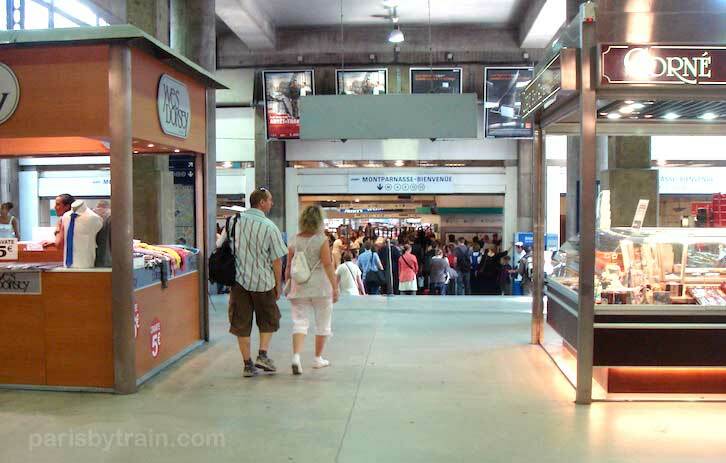 Here we see the entrance for Montparnasse’s Metro station just after the arrival of a Grandes Lignes train from the upper levels, hence the crowd. 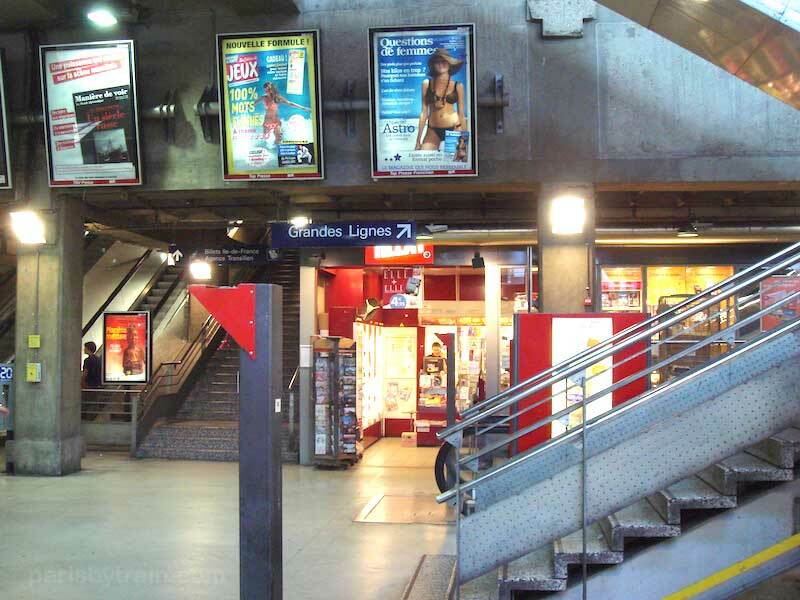 As you can see from the overhead signs in the photo above, Montparnasse’s Metro station connects to Paris Metro lines 4, 6, 12 and 13 (see Metro map). Just past the overhead signs are two ticket windows on either side of the hall and several blue Billetterie Ile-de-France ticket vending machines scattered throughout. 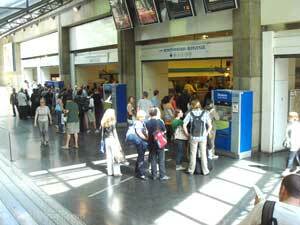 After purchasing your tickets or passes and passing through the turnstiles you’ll need to traverse a long tunnel to where the Metro lines are actually located, which is quite far north Gare Montparnasse (the train station). Due to the length of this walkway, the transit authority is experimenting with a high speed moving sidewalk, shuttling pedestians along at 9km/h rather than the normal 3km/h. 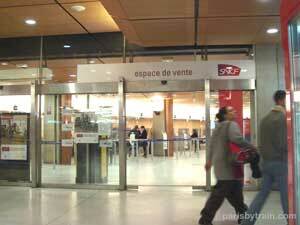 After the tunnel you’ll be at Montparnasse’s Metro station called Montparnasse Bienvenue. Here you’ll have access to lines 4, 6, 12 and 13. 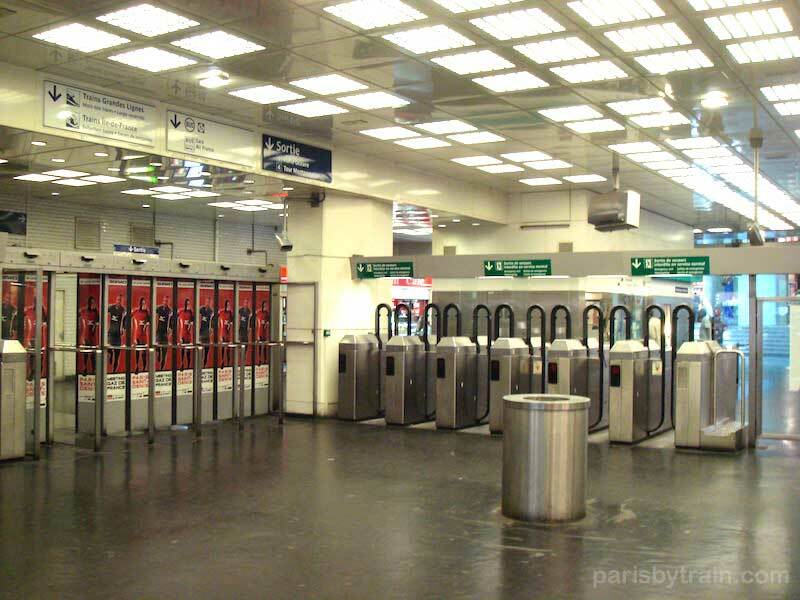 For more information on taking the Metro, see the Paris Metro photo tour. 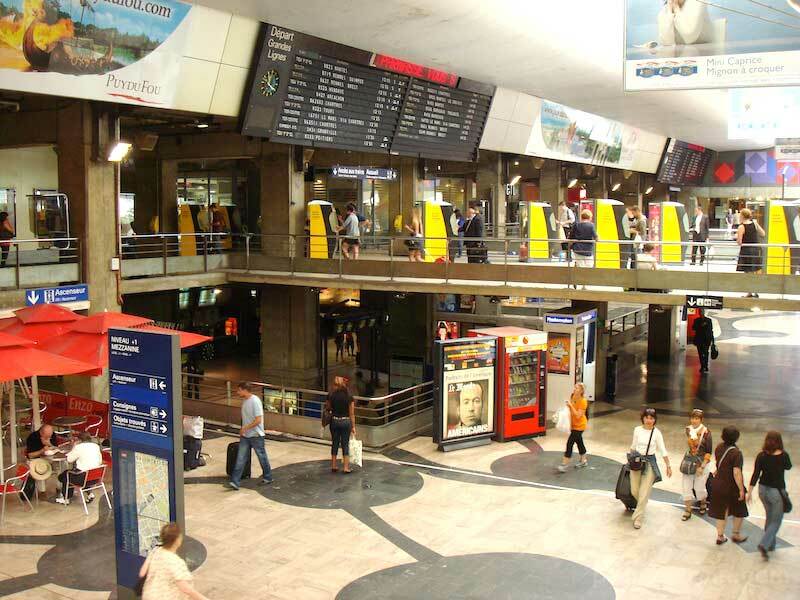 If you’re arriving at Gare Montparnasse from the Montparnasse Bienvenue Metro station, the photo below is the view you would have of the entrance of Gare Montparnasse (and the exit of the Metro area). 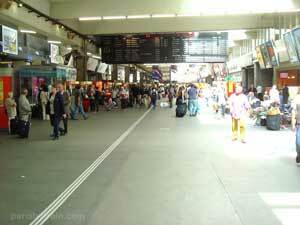 At the top left of the photo is an overhead sign (in white) for Trains Grandes Lignes and Trains Ile-de-France. 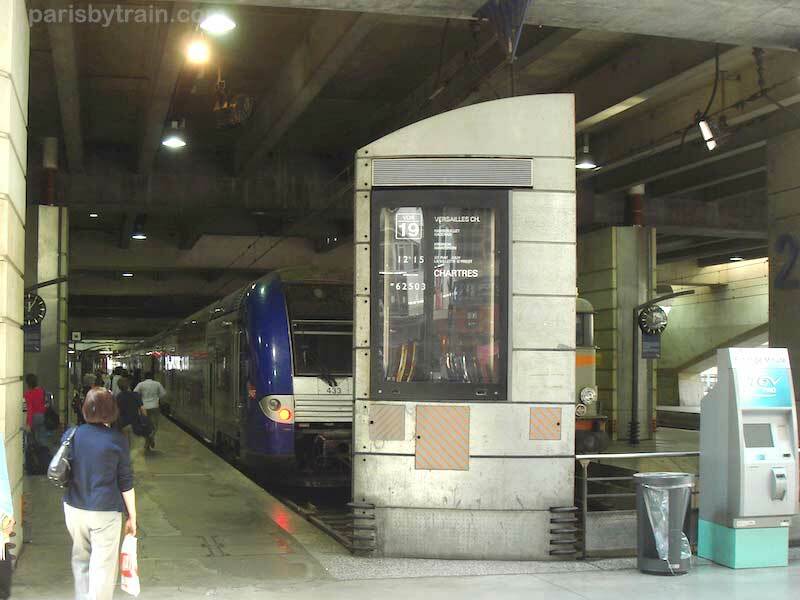 If you’re making a connection to a TGV, Transilien, Ter or Corail train departing from Gare Montparnasse, these are the signs and directions you’ll want to follow. (Link to this photo: Metro turnstiles with luggage). Just past the exit barriers from the Montparnasse Metro (red doors on the left), past the Metro ticket sales hall and ticket vending machines, up the few short steps, you’ll enter an area with shops, escalators and four sets of stairs leading up, two in front, two to either side (see below photo). Near the center of the photo is a small blue sign reading Grandes Lignes with an arrow pointing up. 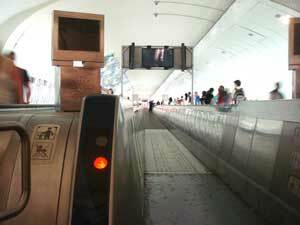 Take those stairs (or the escalators) and climb up 3 levels to Niveau 2 to get to the TGV, Ter and other intecity trains. After this point you may only see signs that read: “Access Aux Trains”. That refers to the Grandes Lignes Trains at Hall Maine so you may follow these signs as well. 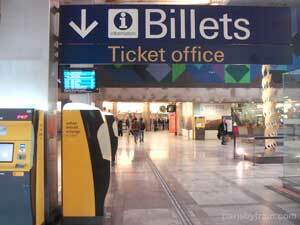 Tickets for Transilien trains can be purchased from Billetterie Ile-de-France train ticket vending machines and from the ticket window just off to the right in the above photo. Back to Gare Montparnasse’s main train station section. 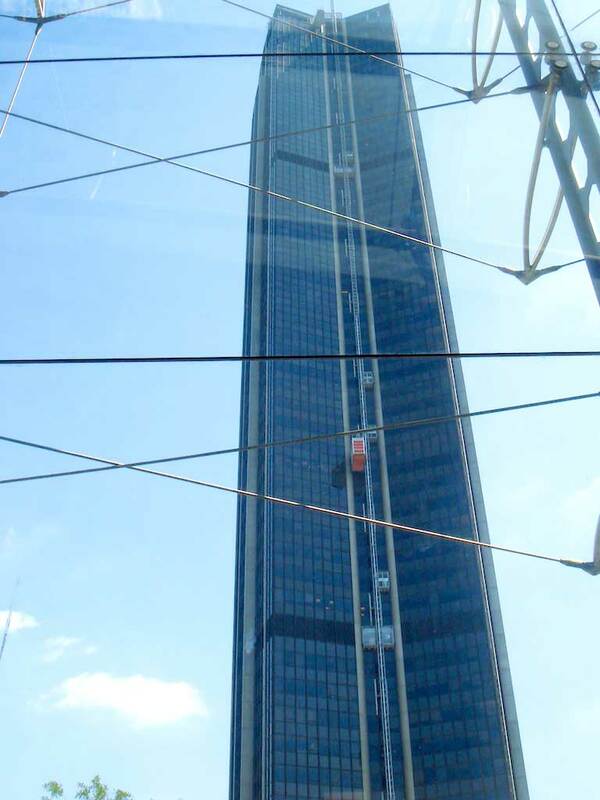 Above is a photo of multiple levels of Gare Montparnasse, taken from Level 2 (“Niveau 2”), two floors up from ground level. Looking down at Level 1 we see the Mezzanine, which has baggage storage (“Consignes”), Lost and Found (“Objets trouvés”) and some food services. 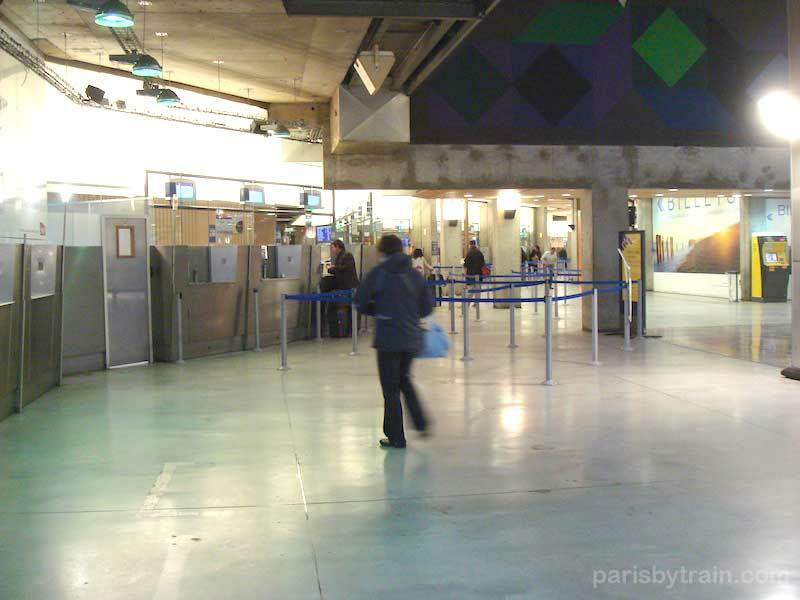 Further down, near the middle of the photo, we see the subterranean access to the lanes (“voie”) for Transilien/Ter commuter trains which are parked up on Level 2 between lanes 18 to 28. 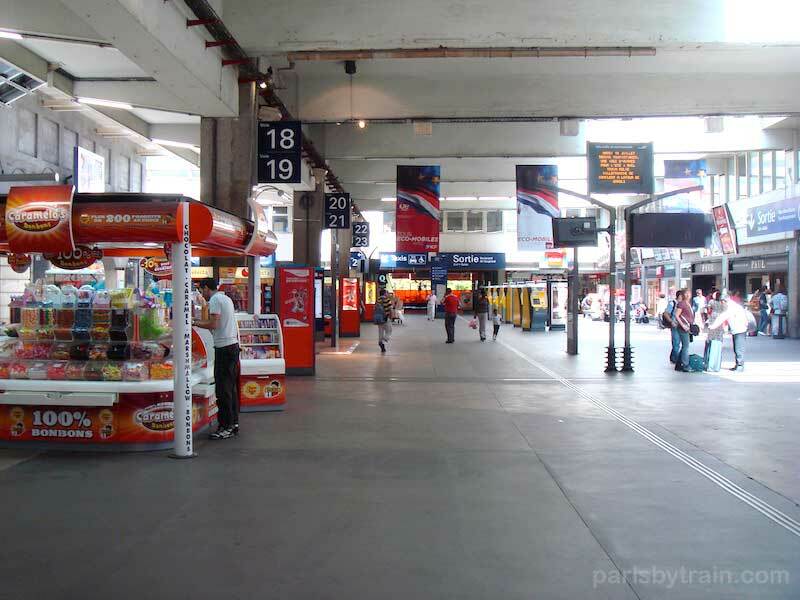 This below ground level entrance allows you to pop up onto the train lanes halfway down the platform, useful for long trains, giving travelers on the latter half of the parked train quicker access to the Metro. At the center upper part of the above picture is a black departures board, showing trains that are schedule to depart soon from Gare Montparnasse. 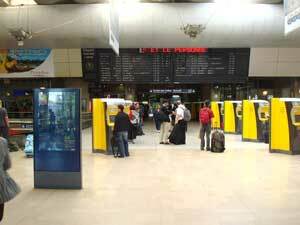 The yellow boxes scattered through the middle of the photo are Grandes Lignes train ticket (TGV, Corail, etc.) change, collection and vending machines which take credit/debit cards. Above is another photo of the departures board from head-on. Just below the board is a sign reading Access to Trains (“Access aux Trains”). The short hall past the ticket machines leads into Hall Maine, where all the TGV, Ter and Transilien trains are parked at lanes (“voie”) 1 to 28, starting from the left (east). 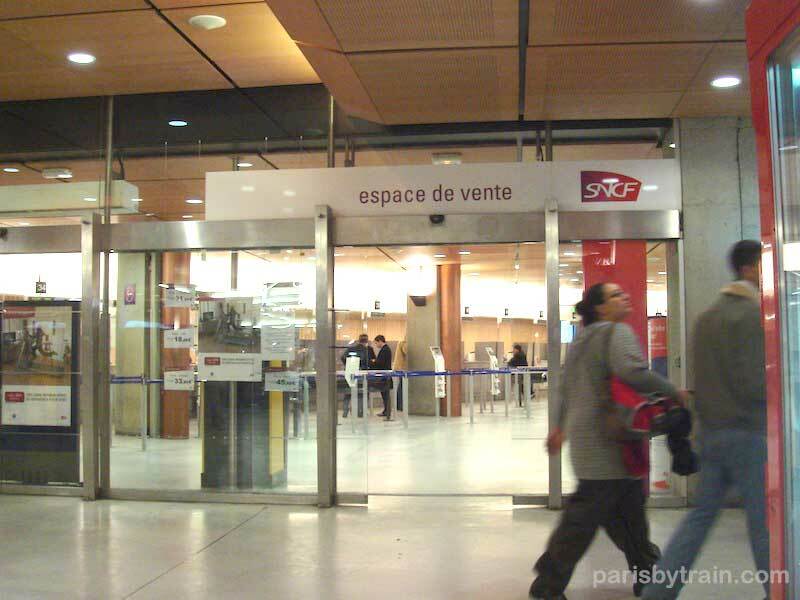 Further to the right are ticket counters for Grandes Lignes train tickets which includes TGV, Ter, Téoz, Corail, Lunéa brand French trains which travel to other cities across France. If you’re not in a rush to buy a ticket and hop on the next train, this is where you should buying your train tickets. Below is a map of Montparnasse Level 2 showing the layout of the train ticket office on the bottom left and its three counter areas: Réservations Internationales (International Train Reservations), Réservations Grandes Lignes (TGV, TER & other intercity trains within France), and Billets Départs Immédiats (Tickets for Immediate Depatures). This Montparnasse map is courtesy of Gares en Mouvement. Visit their site for a full version. The picture below taken from the left end of Hall Maine, Level 2, where the lane numbers are low and climb as one moves further down the hall. At the top center of the photo below is a large black departures board showing when trains are departing, their destinations and from which lanes. 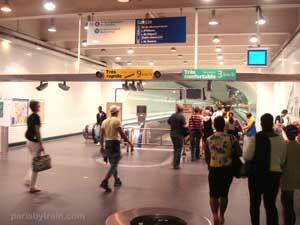 The trains are parked on the left, starting with Lane 1 (Voie 1) and climb as you move further down the hall. The ticket counters described in the previous section are off to the right of this position (not visible in the photo). Each of the lanes terminates with a column showing a lane number on the side. TGV lanes 1 – 9 are marked with a TGV insignia near the tops of the columns. Ter, Transilien commuter trains and finally more TGV trains are parked between lanes 18 to 28. 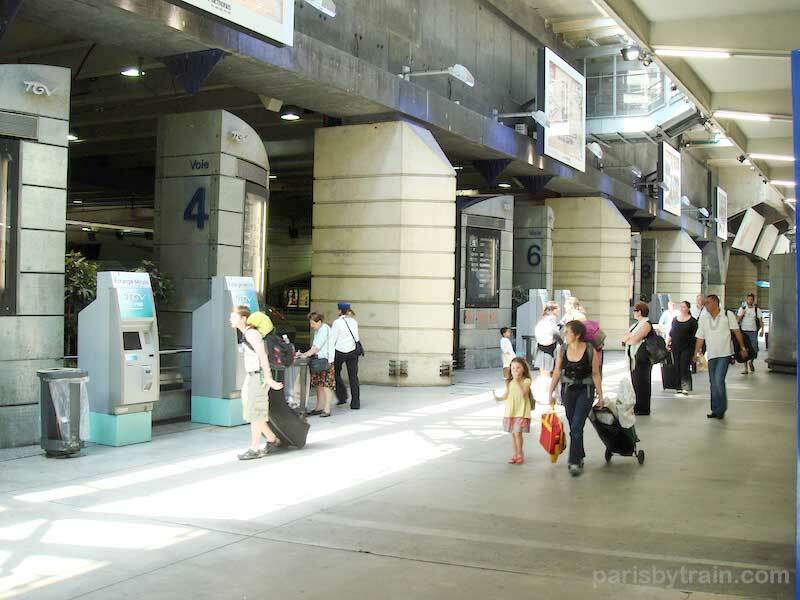 On the front of each column marking the lane you’ll find the lane number (“Voie”) and train information including direction and stops along the way. In the photo below, at the far end of Hall Maine you’ll notice that the train lanes stop at 24, yet there are 28 lanes in total at Gare Montparnasse. On the far wall is a sign pointing to lanes 25 to 28, located diagonally to the left past lane 24. 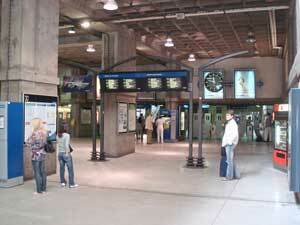 This area is also referred to as Montparnasse 3 or Gare Vaugirard. If you’re arriving at, rather than departing, Gare Montparnasse by TGV, Ter, or Transilien train and are looking to make a connection to the local transit options, follow the large blue overhead signs pointing towards buses and Metro lines located ahead and below at Street Level (Niveau 0) and Sublevel 1 (Niveau -1) (overhead signs in blue can be seen at center left of the above photo). 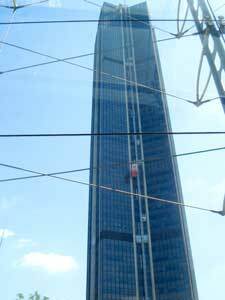 To help get your bearings after you’ve arrived and are still on Level 2, walking straight out from the main train lines will give you a view of Tower Montparnasse (Tour Montparnasse), which is very visible out the front window of Gare Montparnasse. You are facing north east from this position. 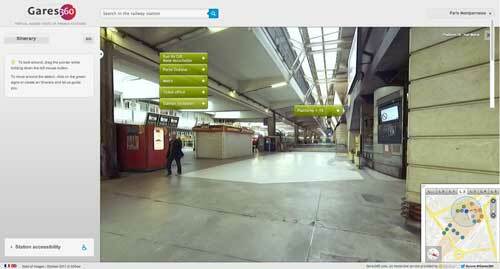 Gares360.com has produced a virtual photo tour of Gare Montparnasse. Select the level and vantage point you’d like to see using the map at the bottom right-hand corner of the screen. Click and drag the image to change the angle of view.